Regular Pandaw guests know about our fascination for the rich history of British rule in Burma, on whose legacy our pioneering company was built. Over the past 21 years, uncounted onboard talks and guided tours have explored this cross-cultural encounter – warts and all. What's so exciting about our first sea cruise in Burma, our new Ranoon to Ranong and the Mergui Archipelago expedition (from 2 Oct, 2016) is that it is our first to turn to the earliest chapters of that story. A highlight of the 11-day adventure is a visit to the port of Mergui, (formerly known as Mergen, now also known as Myeik). This was the haunt of "Siamese White". Siamese who? Forgotten for centuries, Samuel White (c1650-1689) was one of the most daring rogues in the history of the East India Company. His story – too implausible for fiction – reads likean action movie, tailor-made for one of the over-the-top style of Hollywood star, Al Pacino, Johnny Depp or Daniel Day Lewis. As a young man, White started off as a Bristol seaman seeking his fortune via the East India Company system, evolving since 1600. Like others he quickly understood that in a land where anything goes, vast fortunes were best earned by circumventing the rules. But as the extortionate greed, violence and threats turned to murder and mayhem and an apocalyptic climax, White ended up as a kind of Jacobean Mr Kurtz. That we know so much about White is thanks to the wonderful book Siamese White (1936, reprinted 2008) by Maurice Collis, an Anglo-Irish administrator-turned-literary man. Collis (1889-1973) was himself based in Mergui, and his own chequered career in the Burma service is an interesting story in itself, to be told elsewhere in this blog. Suffice to say here that anyone booked, or considering booking our a journey in to the pirate-infested history of the Mergui Archipelago will find Siamese White essential background reading. Most of us who think of British involvement in the East as an 18th and 19th Century phenomenon. But by the mid-to-late 17th Century there was depth and sophistication in the East India Company's commercial and quasi-diplomatic activities in the Indian Ocean. This was the era of James II, periwigs, tricorn hats, slightly predating Robinson Crusoe . Collis's tale of "a freeman of England making a fortune in the whirligig of eastern politics" reads like a Boys' Own adventure, but it is more historically significant than that. Scholars still cite this book as one of the sources of information on the early European encounter with Southeast Asia. A daring, and wholly unscrupulous adventurer, White was a master of the cut-throat culture of "interloper" trade around Tenasserim, the west coast of the Kra Isthmus. This strategic territory changed hands incessantly and bloodily between Siam and Burma through the centuries. It is now the Burmese province of Tanintharyi, the locus of the first coastal expedition of MY Pandaw Explorer. Starting off as a small cog in complex trade network, White quickly achieved gangsterish greatness. At that time Mergui was the Indian/European doorway to the Thai capital Ayudhaya (modern day Ayutthaya), which in turn was an entrepôt for Western and Middle Eastern trade with China and Japan, Through his brother's connections with a better-known Western adventurer the Greek-born Constantin Phaulkon, "mandarin" in the court of the Siamese King Narai, White became, nominally at least, a servant of this "heathen prince" at Ayudhaya, who at this time was overlord of the Indian Ocean coast. No known images survive of White survive (the accompanying picture is of a contemporary British adventurer) but his outline is clear enough from Collis's book. He was a piratical opportunist, working to outmanoeuvre the Muslim traders who previously sub-contracted trade relations for the Siamese, while making the most of his official status to cut cosy deals with friend and foe alike. He built up a vast fortune through daring coastal raids, naked piracy and cooking the books, while constantly plotting his escape with his loot from his palatial lair in Mergui back to Britain. He was never more than a few steps away from a sticky end at the hands of the British or the Siamese, both of whom he habitually double crossed. A Siamese sticky end, as detailed in this book, was certainly one to be avoided. The climax to all this came in 1687 where the crazed escape plans of the debauched and nearly cornered White, who had long since thought nothing of beheading people on the spot, drunkenly precipitated chaos to a mass slaughter of the 60-strong foreign community in Mergui. This is just one of the many forgotten chapters in the lurid and fascinating history of this little-known corner of Asia. White: "If ever a King's Captain or Lieutenant of them all comes ashore and tells me that I must go to Madras and should pretend a power to force me thither, I'll be the man that will pistol him upon the place with my own hands, and wipe my Arse with his Kings Commission." A word of caution: This being a true story rather than fiction it is quite convoluted, full of red herrings, obscure motives and undeveloped characters (not to mention innumerable confusing misprints). But as a portal into the daily life, colour and atmosphere of the first British engagement with Burma, it is unsurpassed. 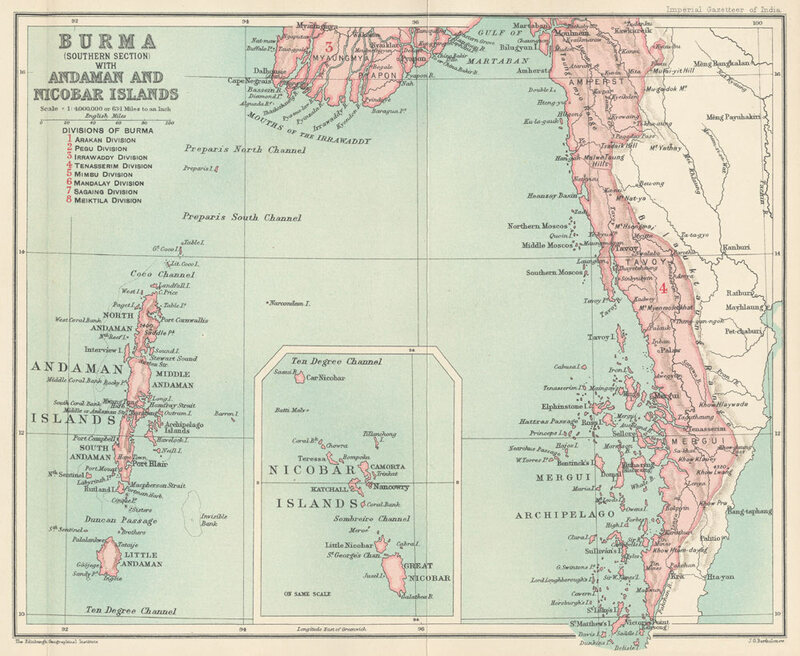 Pandaw's guides will have a lot to material to work with as the MY Andaman Explorer takes its passengers right back to the earliest roots of British Burma.